Meatloaf has international variations but usually calls for bread crumbs, milk, eggs, onion, and ground beef. 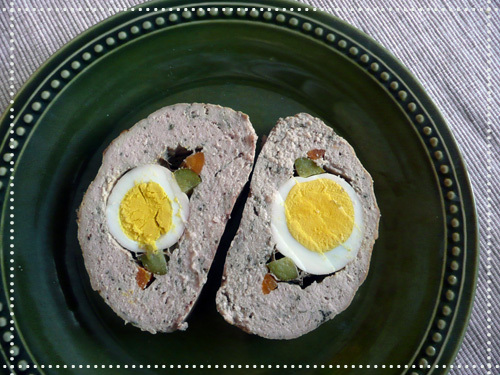 We will skip the bread crumbs and will add eggs and ground pork. You can prepare it the old-fashioned way or try this low-carb version packed with veggies. This home-style meatloaf dish is easy to make and full of flavor. The pickles and baby carrots add a delicious twist to the classic recipe. You can also include celery, onion, and garlic to add more flavor. Whether you add more ingredients or not, this recipe is simply the best around. Mix the ground beef, pork, salt, pepper, cumin and mint in a large bowl. Add the raw eggs and combine well. Use parchment paper to line the baking dish. Spread the meat mix and form a rectangle. Peel the hard boiled eggs and arrange them to form a row with the carrots and pickles. Then fold the meat mix on top of the eggs and press down to form the loaf. Heat the oven to 400F or 200 C. Add 1/2 cup of water into the baking dish. Cover the baking dish with aluminum foil and bake the meatloaf for 1 hour or until browned. Serve hot. For your convenience we've created a visual guide to help you prepare this great meal.